Jasper Johns, considered one of the most important living post war and contemporary artists, has been making International headlines since the 1950's when The Museum of Modern Art (MOMA) acquired the artist’s breakthrough American Flag painting, a gift of Philip Johnson in honor of Alfred H. Barr, Jr. When Jasper Johns created Flag, the dominant American art was Abstract Expressionism, which enthroned the bold, spontaneous use of gesture and color to evoke emotional response. Johns, though, had begun to paint common, instantly recognizable symbols—flags, targets, numbers, letters. Breaking with the idea of the canvas as a field for abstract personal expression, Jasper Johns painted things the mind already knows. Using the American flag, Johns said, took care of a great deal for me because I didn't have to design it; that gave him the freedom to focus his attention on making paintings. On May 11 and 12, 2010, Christie's New York, will offer Jasper Johns’ Flag, 1960-1966, painting from the Collection of Michael Crichton, and its eventual multi- million dollar auction result will, without doubt, make headlines. 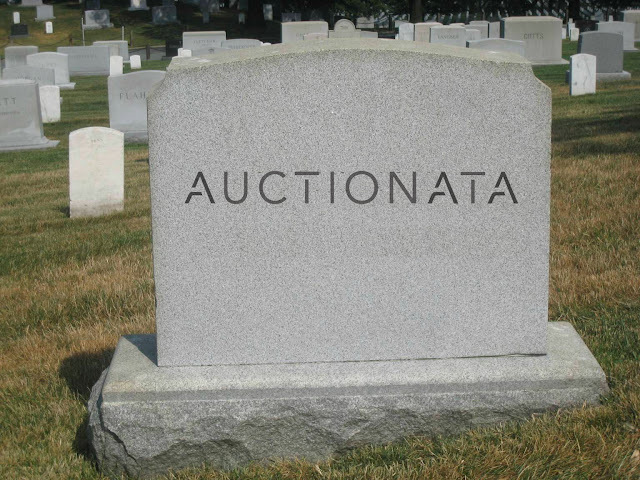 At minimum, the result will not only establish a new auction record for all paintings created by Jasper Johns, but may also establish an all time record for a work of art sold at public auction. Steven A. Cohen recently paid $110 million for the Jasper Johns Flag, 1958, an iconic red, white and blue flag painting created with 48 stars. 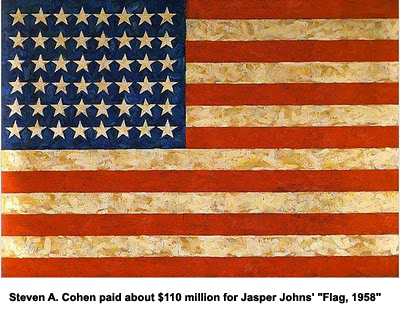 Steven A. Cohen purchased Flag, 1958, the iconic Jasper Johns masterpiece from the collection of Jean-Christophe Castelli, who inherited the painting, from his father, Leo Castelli, the legendary art dealer who passed in 1999. Prior to its recent purchase, Flag, 1958, had been on extended loan to the San Francisco Museum of Modern Art. Jasper Johns Flag, 1960-1966, an encaustic and collage on canvas, from the estate of Michael Crichton, is certain to establish a new public auction record. The odds are in its favor! Jasper Johns Flag,1960-1966, has never been offered for sale. The painting has an extraordinary provenance. 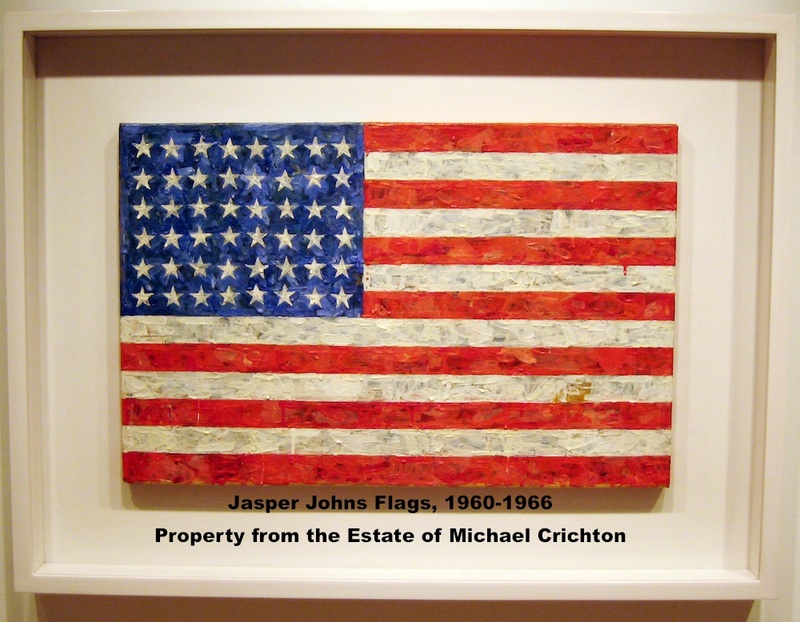 Consigned from the estate of Michael Crichton, the best-selling film maker and author of Jurassic Park, who also authored the Jasper Johns Whitney Museum exhibition catalogue, Mr. Crichton acquired Flag,1960-1966, over thirty years ago, directly from the artist. Only two feet wide, Flag,1960-1966 has the power of a Jasper Johns painting many times larger. Rarely exhibited, the last time was 18 years ago at the Royal Academy of Arts, London, the Crichton Jasper Johns' painting is destined to create International headlines, that could take years to surpass. Over the last six decades, Jasper Johns has created approximately 30 paintings, 14 prints and 50 drawings and works on paper using the iconic flag image in different ways, shapes, colors, sizes, forms and colors. Each is linked by the artist's use of the flag image, and all were created not because of the artist's patriotism, but because the flag is a part of the things the mind already knows, similar to the artist's Targets, Alphabets, Numbers, Maps. Like the artist’s Targets, Maps, Numbers, and Alphabets, the American flag fulfilled Jasper John's interest in depicting "things the mind already knows”, pre-determined, recognizable images that allowed the artist to focus on surface and execution rather than subject matter. "It has been suggested that the American flag in Jasper Johns work is an autobiographical reference." Incorporated in Jasper Johns' The Seasons, 1987, the red, white and blue flag seems inescapably to refer to his Johns' art. Over the last six decades, Jasper Johns has made a point keeping his iconic flag image fresh as he keeps changing the spacial relationships of the flag. Recently, Jasper Johns created two linocuts that the artist also published featuring the red, white and blue American flag along with the artist's portrait and George Ohr pottery. A unique Jasper Johns painting and work on paper commands millions of dollars; that is not the case for JasperJohns prints. Jasper Johns prints are especially good value; the artist has created an extraordinary body of museum quality prints that are coveted Internationally by museums and private collectors. 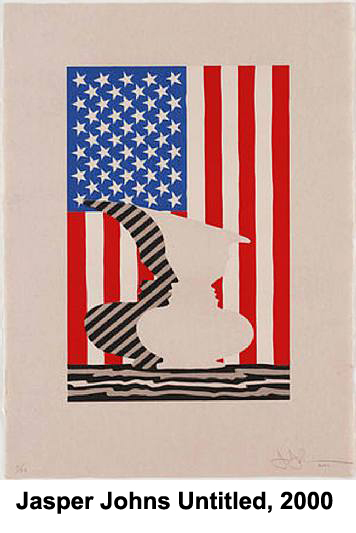 Of the 14 prints featuring the American flag, the red-white-blue flag is a dominant image in 5 prints, including: Flags I, 1973, published by Simca; Two Flags (Whitney Anniversary), 1980, published by Gemini; Flag On Orange, 1998 and Flag and Vase, 2001, a smaller version of Untitled, 2000, published by Low Road Studio. Aside from Jasper Johns' Flags I, 1973, the classic double flag screenprint published at Simca, many JasperJohns prints, especially those with the flag image, are not only museum quality, but also reasonably priced.